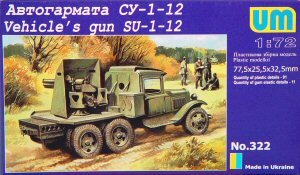 The SU-1-12 anti-aircraft gun truck (also identified in the instructions as the SU-12), is 76.2mm gun and mount that is mounted to the back of a GAZ truck. I believe in today's world we'd call it a 'technical vehicle'. This was one of the most widely deployed AAA support vehicles which were assigned to mechanized units of the Soviet Army. The gun truck was manned by four soldiers and normal ammo capacity was 36 shells. Weighing in at 4 tons, the GAZ AAA truck could travel up to 60 kph. The gun mount could traverse 270 degrees, with the centerpoint to the rear of the truck. The kit is molded in green styrene and presented on four parts trees, plus a bag of 11 rubber tires. The first tree contains the parts for the truck bed gun mount and gun. The second tree has the cab and the standard wood stake truck bed not used here. The third tree contains the front fenders, chassis and suspension, whilst the fourth tree has the remaining suspension parts and wheels. This kit is well-detailed for a 1/72 truck kit. There is a flat-head engine under the hood, a fully detailed cab with separate driver and passenger doors, and a detailed chassis and power train.